The region surrounding Farina is brimming with outback attractions, both natural and man made. Points of interest include Maree and the Strzlecki Track, the stunning Ochre Cliffs 5km north of town, the township of Marree and the eccentric Talc Alf. Additionally the Oodnadatta Track runs through Farina, offering sometimes challenging driving and beautiful natural landscapes. The Strzlecki Track to Innaminka starts at Lyndhurst. The Strzelecki Track is steeped in history: discovered and named by Charles Sturt in 1845 the Strzelecki Creek and the subsequent discovery of the Cooper Creek opened the area. The actual “track” was originally blazed by Harry Redford, a cattle thief droving 1000 stolen cattle over untracked country from central Qld to Adelaide. The thief was caught out, but due to his heroic efforts in establishing a new stock route he was let off and became one of the greatest drovers in Australian history. But the tragic death of explorers Burke and Wills on the banks of the Cooper Creek near present day Innaminka is the region’s most famous incident. In 1861 the South Australian government offered 2000 pounds to the first explorer to reach the top end of the continent. 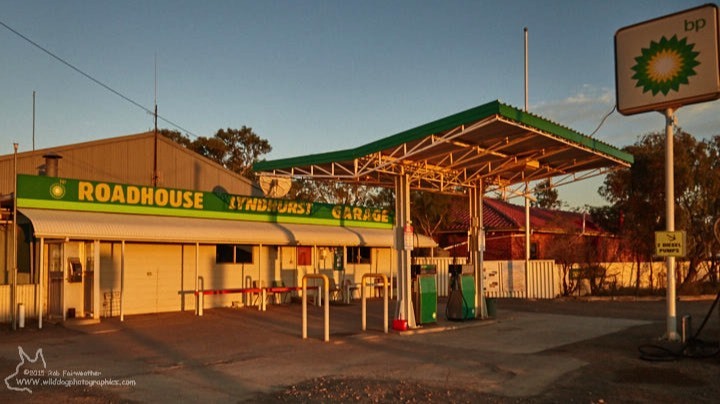 The Lyndhurst Roadhouse re-opened in mid-January 2016, managed by Tammy and Ken. A week after they opened, a number of our members had dropped in for a meal and were pleasantly surprised – by both the amount and quality of the food served, and the (very) pleasant company. 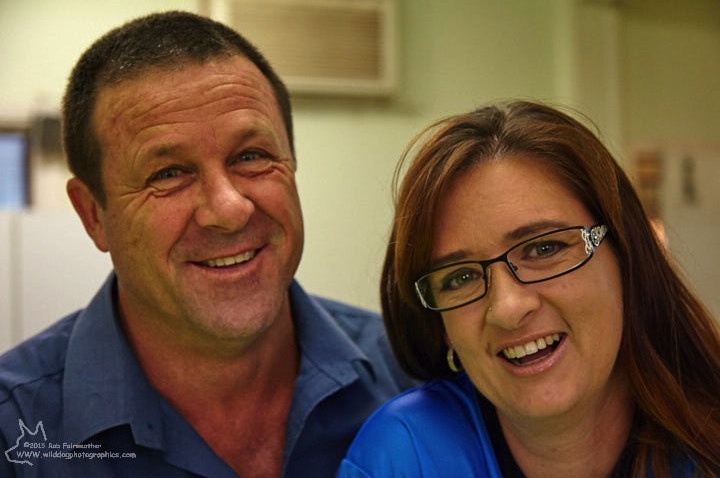 Tammy and Ken have also offered to help us with emergency cold storage during the works program… Thanks guys!The roadhouse can be contacted at this address. There is very little in Lyndhurst apart from the now famous, thanks to numerous magazine and TV pieces, Talc Alf who, apart from producing some quite interesting, if very stylised, carvings in talc stone, has a highly eccentric explanation for the origins of the alphabet. He has a sheet which explains all his theories but you’ll get the idea by knowing that his explanation for the letter ‘B’ is that it is the second letter in the alphabet and it is the symbol for women. ‘A’ is for man and ‘B’ is for woman – women come second in his pecking order. No sexism here. And that ‘B’ on its side is a visual depiction of a women’s breasts. One presumes that lower case ‘b’ indicates one breasted Amazons. The theory is strong on entertainment value and sexism and rather weak on logic and common sense. Oh, and by the way, when you combine A (man) and B (woman) with ‘original’ you get, wait for it, Aboriginal – the first men and women. One of Talc Alf’s inspired creations is a new Australian flag where the red, black and gold Aboriginal flag simply replaces the Union Jack. Talc Alf, his real name is Cornelius Alferink, is located a couple of kilometres out of Lyndhurst on the Innaminka Road. His shop is very clearly signposted. Near the town’s solitary pub is a white plaque commemorating the Simpson Desert expedition of 1939 in which Cecil T. Madigan and his party crossed the harsh dry region to the north of the town. 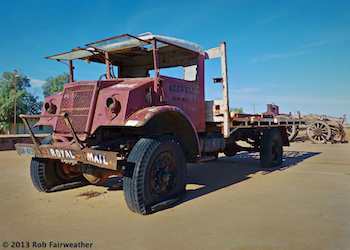 In Museum Park, in the centre of town beside the old railway line, is the famous old mail truck which Tom Kruse used to transport mail from Marree to Birdsville along the Birdsville track. Kruse’s adventures were superbly captured in the 1952 documentary Back of Beyond which chronicled the hardships and ingenuity involved in taking mail and supplies across a desert prone to flooding, being bogged in sand dunes and breaking down hundreds of kilometres from any kind of garage service. Interestingly the old truck has E. G. Kruse on the side and no one in town seems to know where the name ‘Tom’ came from. The town’s demise occurred in 1980 when the railway was closed. There is something sad and rather forlorn about the rolling stock which stand at the disused station slowly rusting away. 5 km North of Lyndhurst there is a tyre beside the road with the words ‘Ochre Cliffs’ crudely written on it. 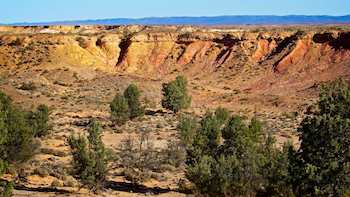 A road heads off the main track to the west for a couple of kilometres before reaching a remarkable quarry which is a feast of harsh desert colours – reds, and yellows and browns. It was an important site for the local Aborigines and it is believed that ochre quarried here was traded with other groups of Aborigines who lived hundreds of kilometres away. 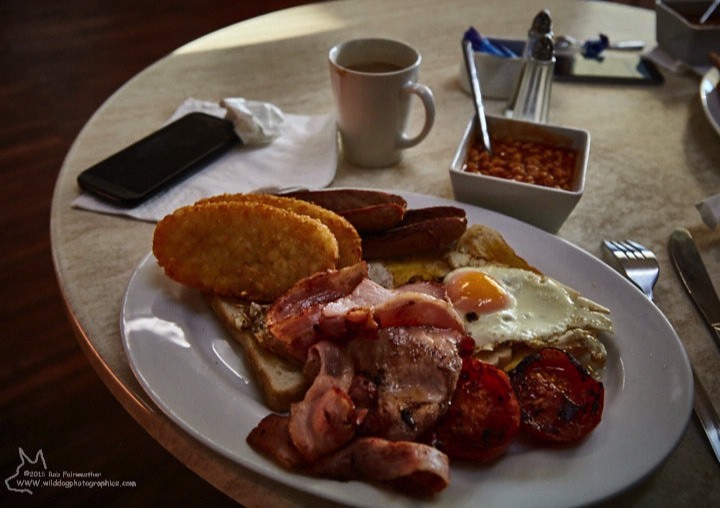 Travel on the Oodnadatta Track and stop over at Farina! 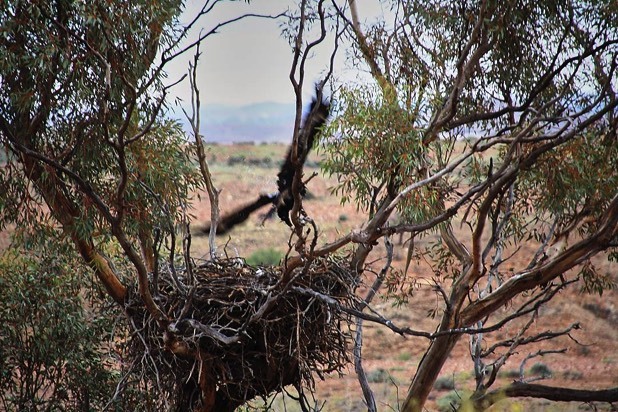 This image of a wedge tail eagle rapidly leaving it’s nest was supplied by Michael Witcher, a volunteer who, during his stay at Farina this year for weeks 3 and 4 of the works program, went on one of Kevin Dawe’s Station tours. Obviously his vehicle was still moving, and this was necessarily a “snap” shot, where any delay would have meant no photograph at all! Well done Michael!